Ripple Music Studios are proud to present the highly anticipated brand new smash hit single released by Jass Bajwa entitled “Dil Jatt Te” featuring Gurlej Akhtar, music by Dr Zeus! Taken from Jass Bajwa’s brand new smash hit album “Jatt Nation” out now on all major leading digital platforms!! Ripple Music Studios are proud to present the brand new single released by Jass Bajwa entitled “Don’t Judge Me“, music by Rick HRT! White Hill Music are proud to present the highly anticipated brand new hit single released by Jass Bajwa entitled “Butterfly” featuring MixSingh!! 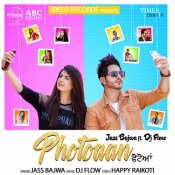 Speed Records are proud to present the highly anticipated brand new single released by Jass Bajwa entitled “Photoaan” featuring DJ Flow!! ARE YOU Jass Bajwa? Contact us to get a featured artist profile page.